O.M.G. This thing is amazing! Sprouts came up quickly & grew at such a fast rate I was astounded. And it was so easy for me. Fill the reservoir every two weeks & ignore it. I could do that! But…. Then I wanted to grow more. More! But there was no more room. All six planting thingies were filled. I sure wasn’t going to spend $120-$180 on another unit. So I started researching DIY hydroponics. During that time I also decided to start some sprouts. Long story short, though the sprouts did well, it was too hard to transplant into the hydroponic system, so I just gave all my sprouts to my neighbor & started over. Supplies needed for the Kratky Method of Hydroponics…. Since I started the whole experiment with an Aerogarden, I went with what I knew, and expanded to using mason jars (ie: the Kratky method of hydroponics) using the items I was comfortable with. PH plays an important part in keeping your plants healthy. The water that comes out of my well is almost balanced. I just need to add a bit of lemon juice to it. (Free since I have a HUGE bottle in my fridge for lemon water.) I get it at Sam’s Club. You can see the complete set up with the jar, water, cup, moss, cardboard top, label and plant in the picture to the right. From seed, 12 day old radish. Using this method, the sprouts grow FAST. I’ve read that they will grow 2-4 times faster than in soil. I am getting algae from the light, however, and need to paint my mason jars black. I tried using some barley straw I had from when we had a pond, but it’s not working. I don’t want to use pennies as that puts heavy metal into my food. So, painting the jars black will be the best thing to keep the light out of the water. The light just needs to hit the plant. Using this same method, I have expanded my experiment beyond the Aerogarden stock items. Besides the food & seeds, that’s all you need for this setup. The very bottom of the cup is touching the water when the seeds are planted in your medium so the medium (and seeds) stay moist. Once roots grow, only the roots should be in the water, not the basket/cup. As the water level goes down, just fill the jar up with more water to the appropriate level. This method gives the plants their needed water, food, and air. Two harvests of dill. One at 35 days, one at 48. I have made two harvests so far with my dill, basil, mint, and parsley to keep them from getting too leggy. Only because they are in small jars and not a larger pot or in the ground. There are several types of hydroponic systems. Six, I believe. Some use buckets, air stones, water ‘fountain’ pumps, drip lines, or spritzers. I’m currently experimenting with 3 types right now. This is by far the cheapest & easiest setup. And it works! I also am using this system to the left. It’s a bit more ‘complicated’, but still easy! I’ll post about that once I work more with it. This system uses an air stone to circulate the air in the tub. 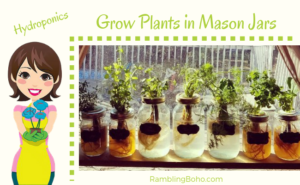 It uses the same concept as the mason jars with the baskets, water, and growing medium. It’s just a little more advanced.